Last October at the Advancing Racial Justice in 2015 conference in New Orleans, The Alliance to Reclaim Our Schools announced the launch of a national campaign to win the schools all children deserve. 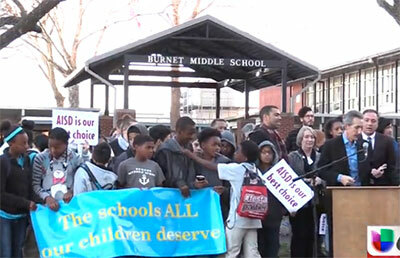 After months of planning and building, February 17 marked the first big action in that effort. It was quite the time! 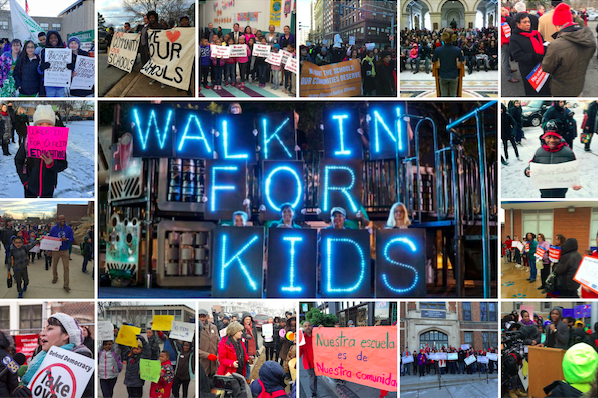 40,000 people participated in walk-ins on and around Feb. 17 at 838 schools in over 30 cities. We want to say a huge thank you to every student, parent, educator and community member who turned out! Together we demanded high quality, well-funded public schools, a stop to the state takeovers of school districts, an end to over-testing, accountability for the charter school industry, and racial justice and restorative justice in every school. We sent a powerful message to the enemies of public education, unified our base, and pointed a way forward! We're still compiling all the amazing pictures and news clips from this week. We've posted some of our favorite pictures and a short video recapping the event below. You can view a partial list of media coverage here. We also encourage you to sign on to our platform to show your support for the national fight for public education. Lastly, if your organization would like to join the AROS network, please fill out this form and contact AROS Campaign Director Madeline Talbott (mtalbott321@yahoo.com).